Robert Deaville of CSIP is about to perform an autopsy on a stranded dolphin. Extreme Field WorkA series about how science gets done in Earth's weirdest, wildest environments, from the bottom of the ocean to erupting volcanoes. A dolphin post-mortem may not be everyone’s cup of tea. Many people have a soft spot for the highly intelligent cetaceans, so watching a recently deceased one get comprehensively dissected by tools including a pair of rudimentary garden shears can be tough. Warning: This article contains graphic photos. But for Rob Deaville and Matt Perkins from the Cetaceans Strandings Investigation Programme (CSIP) at the Zoological Society of London (ZSL), it is literally another day in the office. That office is a slightly cramped lab in a building across the street from London Zoo’s giraffe enclosure. Funded by the UK government’s environment department, CSIP was established in 1990 to better understand the biology of marine life and to build up data on trends that could be impacting how animals are faring out in the ocean. Of the roughly 800 strandings that are reported every year in England and Wales, the team is permitted to perform about 100 necropsies on dead cetaceans, along with necropsies on a small number of sea turtles that have stranded. 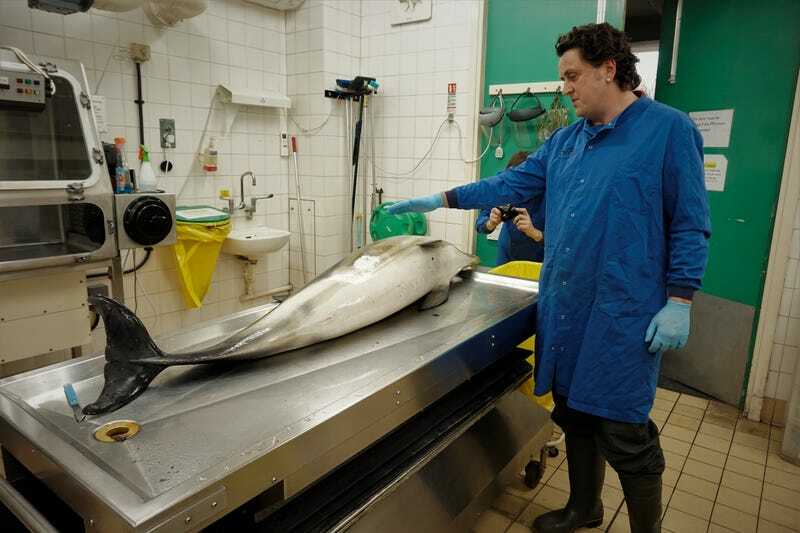 A common dolphin brought into CSIP’s lab for an autopsy after stranding. “Today’s subject, you’ll be pleased to hear, is actually very fresh,” Deaville tells me with a smile before beginning the post-mortem I dropped by to see on a recent Wednesday afternoon. The subject in question is a common dolphin that Deaville travelled to the border of England and Wales to collect earlier that day. The two meter-long creature had live stranded several times after being refloated. After it became clear the animal was too weak to swim away, local authorities made the decision was to euthanize it rather than letting it suffer and eventually die on the beach. Marine biologist Matt Perkins examines a dead dolphin at CSIP’s lab. Cetaceans have been washing up worldwide since time immemorial. It can be a single dead porpoise, numerous whales one after the other (in what are often declared Unusual Mortality Events, or UME) or literally hundreds of creatures at the same time. Deaville says the biggest stranding on record is estimated at 1,000 pilot whales in New Zealand. The potential causes of these strandings are numerous, ranging from illness in a pod to navigation issues. Post-mortems help scientists paint a picture of why individual strandings occur and factors driving the phenomena more broadly. And Deaville has done his share. In his 25-plus years with ZSL, the scientist with a silver-colored whale fin earring in his left ear has conducted hundreds of examinations on a vast array of species. All of this data, collected over decades, has helped has helped inform scientists about threats to marine life, including cetaceans getting killed as bycatch during fishing operations, the harm done by toxic chemicals including polychlorinated biphenyls (PCBs), and noise pollution from shipping and other human activities. Robert Deaville performing the autopsy. Harbour porpoises, followed by common dolphins, are among the most common species of cetacean found in UK waters and consequently are the “bread and butter” of the CSIP’s work. While reports of other, larger species stranding are less frequent, the data built up over time offers clues as to how more rarely-sighted cetaceans are faring. For instance, after stranding records were started by the Natural History Museum more than 110 years ago there were no reports of a humpback whale stranding in Britain for 80 years. But in the last 30 years, there have been 30. By contrast, Deaville has not had performed a post mortem on a killer whale since one washed up in the Mersey Estuary in the northwest of England in 2001. Their absence is reflective of their reduction in numbers and contraction of range around Britain. A dead killer whale that washed up in the Mersey Estaury in 2001, the last time one of the species stranded in England or Wales. The UK population is now small and confined to the remote north of Scotland. In order to keep up-to-date on strandings as they occur, staff with the CSIP are highly dependent on the public. They spend a lot of time on the road responding to calls from folks who spotted a stranded animal. For instance, at the beginning of February Deaville set off to pick up two porpoises from the south of coast of England not too far from his home in Brighton. Further calls throughout the day meant he ended up with three porpoises and a dolphin in the back of his car after detouring over to the East coast. “A volunteer had very kindly kept the animal in their garden for me,” he said, referring to a harbour porpoise recovered in Suffolk that had died after what appeared to be an earlier encounter with a grey seal. The dolphin, meanwhile, had bits of fishing nets wrapped around it, evidence that it may have died as a result of bycatch. For many members of the public a stranding is a once in a lifetime occurence. The CSIP teame examining one of the 30 sperm whales that washed up across Europe in 2016. Back in the lab, after talking me through a photobook of some of the more memorable field necropsies, the two biologists measure today’s dolphin. They quickly confirm that it’s a male juvenile, meaning it could be anywhere between one and eight years old. After the initial measurements, they cut away a slice of the blubber, which can be key in revealing its condition: Often if animals have not been feeding they start to use blubber reserves to survive. It is soon evident this animal is “nutritionally compromised” or put simply it has not been feeding, which may be the reason it was unable to re-float. Blood and guts galore as the dolphin autopsy continues. Deaville then uses the garden shears and other tools to dissect the dolphin. Samples of bile, the liver, the spleen and other tissues are taken for later analyses, which will include checking levels of toxins, chemicals and parasites. As the smell becomes funkier and funkier, Deaville removes the lungs and shows how the right lung is a light pink color while the left has a darker purple hue. This is caused by blood dropping from one lung into the other once the dolphin had beached on its side, he explains. An exact verdict on the cause of death will be given at later date by their colleague Paul Jepson, who is a qualified vet. But the priority is to inform the organization in Wales that euthanized the animal that they were justified in doing so because it would not have survived at sea on its own. It’s easy to think of Perkins and Deaville’s work as some sort of CSI for dolphins: While the long running crime show rarely features garden shears and brain buckets, there are forensic similarities. The team has played into this image, using the hashtag #CSIoftheSea (Deaville’s wife came up with it) to publicize post-mortems live on Twitter. But Deaville admits that any implication a crime has been committed when it comes to a cetacean death is perhaps misleading. A fin whale that had stranded several times in the River Great Ouse near the town of Kings Lynn in Norfolk, East England. The unusually warm weather in June of 2018 made conditions tricky for the post mortem. “People often expect a smoking gun, and they’re isn’t always one,” he said. “Plastics are obviously big concern right now, but we have only ever had one animal where plastic was a decisive factor.” He was referring to a Cuvier’s beaked whale (a deep-diving species) that was found in Scotland in 2015 stuffed full of plastic bags. The CSI comparison also doesn’t do justice to some of the unusual challenges those investigating the death of multi-ton marine mammals face. While Perkins says he once got a minke whale into the lab for a post mortem (it was a “bit of a squeeze”) when it comes to the bigger species the work typically needs to be done al fresco, and that can create difficulties. Animals rot more quickly in the warm weather, and the tide can wash even a large whale back out to sea again before the team can arrive. When the corpses do stick around, there are other logistical challenges. A quirkily English royal prerogative dating back to the 14th century called “Royal fish” means that it is the responsibility of local authorities or private landowners to dispose of whales. As you might imagine, the physical removal of an animal that can weigh in at 30 tons is complicated and expensive. 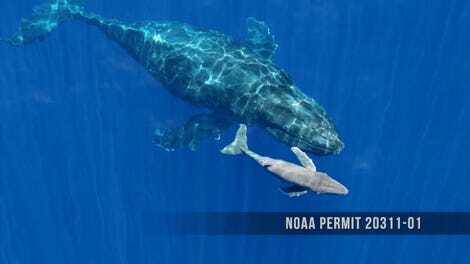 Deaville says he heard of one sperm whale in Edinburgh that cost nearly 60,000 pounds (80,000 USD). The animal usually needs to be divided into large pieces to fit in an incinerator. The lipids in this whale, however, caused some chunks to explode, taking out the incinerator and driving up the cost. While the day-to-day work of performing necropsies on dolphins and porpoises rarely makes headlines, in 2016 the CSIP were involved in one of the most famous whale strandings in recent times. Thirty juvenile male sperm whales washed up one by one, turning the beaches of several countries into a giant cetacean graveyard. The UME exemplified the challenges and benefits of the CSIP’s work. While ultimately, scientists in the UK, Germany and the Netherlands were unable to declare one cause of death or one single reason why the animals were drawn so far from their normal feeding grounds way further north, the rare event provided crucial insight into their behavior. Like the common dolphin I saw in the lab, that information is teaching scientists not only on about how cetaceans die, but also how they live. Greg Norman is a freelance writer and producer, now living back in his native Yorkshire, England who focuses on the environment and conservation. Correction: This article has been corrected to note that the Cuvier’s beaked whale found full of plastic bags in 2015 was from Scotland, not Norway, that Deaville has conducted hundreds, not thousands, of examinations, and that CSIP studies effects of polychlorinated biphenyls (PCBs) not polychlorinated paraffins.